How and Where to Buy Januvia? You can buy Januvia online through CanadianPharmacyWorld.com at huge savings. We do require a valid prescription from your doctor. Our Canadian Pharmacy carries brand and generic medications from Canada as well as other international pharmacies. For more information and further details, please call Customer Service at 1866-485-7979. Are there Alternative Names for the Brand and Generic Januvia? The brand name Januvia comes from Turkey and is manufactured by MSD Pharmaceuticals, the brand from India and UK manufactured by Merck. We may sometimes carry the brand from Turkey, New Zealand and Canada manufactured by Merck. 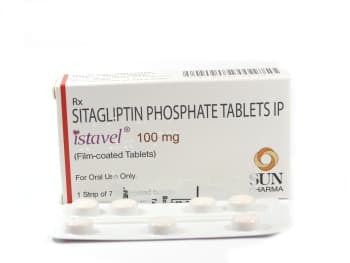 The generic Sitagliptin also called Istavel comes from India and is manufactured by Sun Pharma. We may sometimes carry the generic Januvia from India also called Zita and manufactured by Glenmark. What Dosages and Forms is Januvia available in? What is Januvia used for? Januvia (Sitagliptin) is an oral diabetes medication that is used alone or in combination with other medications in people with type 2 diabetes. Sitagliptin belongs to the group of diabetes medications called DPP-4 inhibitors. This medication works by increasing the amount of incretin released by the intestine which regulates the levels of insulin your body produces after eating. Incretin is a hormone that raises insulin levels when blood sugar is high and decreases the amount of sugar made by the body. Januvia is used with a proper diet and exercise program and with other medications to control high blood sugar. Controlling high blood sugar helps prevent kidney damage, blindness, nerve problems, loss of limbs, and sexual function problems. By controlling your diabetes properly, you may lessen the risk of a heart attack or stroke. The usual dose of Januvia is 100 mg take once daily with or without food. What are the Possible Side Effects of Januvia? Are there any Precautions or Drug Interactions for Januvia? You should not take Januvia if you are allergic to Sitagliptin or if you have any other allergies. Before you start using this medication, talk to your doctor about your medical history and about all the medications you take including OTC and herbal medications. Januvia may cause you to have blurred vision, dizziness or drowsiness. You should not drive or do any activity that requires you to be alert. You should limit your alcohol while you are taking this medication because it can increase your risk of developing low blood sugar. It is unknown whether this drug passes into breast milk. There may be an interaction between Sitagliptin and other medications such as amiodarone, carvedilol, digoxin, epinephrine, propranolol, quinidine, quinine, tacrolimus, tamoxifen, tenofovir, testosterone, trazodone, etc. Januvia tablets should be stored at room temperature between 20 and 25 degrees C or 68 and 77 degrees F away from heat, moisture and light. This medication should not be stored in the bathroom.